Cheapflightsia.co.uk your alternative search assistant to help you find the best possible cheap online flights to Tunisia, cheap holiday deals to Hammamet, excellent cheap hotel deals in Tunis and Yasmine Hammamet, you will also find fantastic deals on cheap car hire in Sousse and excellent holiday rates on foreign currency exchange in Tunisian dinars (TND) the local currency in Tunisia. Cheapflightsia is a gateway that can help you find the cheapest airline tickets to Tunis and Hammamet. The search will find the best cheap flight deals to Tunisa. The city of Tunis is the largest in Tunisia and is situated on the Mediterranean coast. 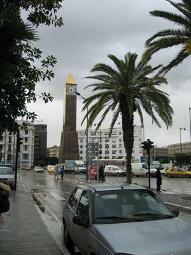 Tunis’ climate is of a Mediterranean nature and comprises of a dry, hot summer, and a cooler winter. The hottest months in Tunis are generally July and August as temperatures average at around 32oC to 33oC, which can feel uncomfortable and humid. The coolest time of year in Tunis is in the winter months of December and January. Temperatures in the winter average at around 6oC to 7oC. The best time of year to visit Tunis is in the months of March, April and October as temperatures average 21oC to 24oC. Arabic and French are predominantly spoken in Tunis. It is advised to learn a few simple words of the French language to ensure communication is possible. Areas of Tunis which experience a great deal of tourism also recognise English, however little of the language is spoken and understood in the more rural regions. The currency used in Tunis is the Tunisian Dinar. Most shops and hotels accept credit cards; however marketplaces like the Medina do not accept credit cards. The journey duration from London UK, to Tunis is approximately 2 hours and 45 minutes. Tunis is predominantly served by Carthage airport, which is located 8km away from central Tunis. Tunisia has a total of six international airports; however Carthage airport is Tunisia’s most popular airport. 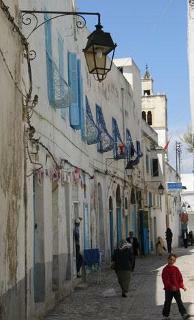 Tunis is home to the Tunis Suuqs (also known as Souks). The Suuqs are a series of covered alleyways and streets which have been converted to selling Tunisian goods; much like a marketplace. Clothes, footwear, accessories, hats, jewellery, carpets, earthen-wear, metal-wear, perfume and books are an example of the many products that are sold within the Suuqs. The Suuqs are well-organised into individual shops, although they appear very busy and chaotic. The atmosphere promotes a true experience of the Tunisian marketplace and culture and is recommended. Be prepared to haggle for the purchase of any goods within the Suuqs as the goods are priced relatively high to allow for haggling. Beware of pickpockets within the Suuqs, as well as over-friendly Tunisians, as some people think of tourists as an easy target for money-related crimes. 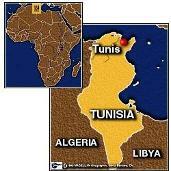 Over 98% of the population of Tunis are Muslim; therefore there are a number of Mosques located in Tunis. The Mosques are of various architectural designs and represent their respective period. The oldest Mosque, Zitouna Mosque, is situated in the Medina. The mosque was first built in 732 AD and is still, today, an important site of worship for the Muslims of Tunis. The quaint, picturesque village of Sidi Bou Said is located just 20km from Tunis and is well-known for its signature use of blue and white colors throughout. There is also a hill within the village that provides the most spectacular views of Tunis and its bay, and is definitely worth a visit. The ruins of Carthage, located approximately 15km north of Tunis makes for a very interesting and educational experience. The town of Carthage was destroyed by the Romans in 146BC and is now a site included on the UNESCO World Heritage List. The Carthage Museum is also located in Carthage and contains remnants exhumed from the town’s ruins.